The Business Park at Dubai South recorded a 400 per cent growth in companies operating in the park since its inception in early 2015 with the number of companies increasing from 900 in 2015 to 4,500 in 2018. An average of 1,500 new companies has joined the park each year. The park also has a high customer retention rate of 98 per cent, which is an indication of the unique services and the added value that the Business Park offers to companies operating in its district. The Business Park at Dubai South offers an environment that enables and encourages businesses to grow, which is due to the various services provided to tenants and the companies operating in the park. Some of the services offered by the Business Park to its patrons includes providing the latest technologies and offering a strategic location that is close to both Jebel Ali Port and Al Maktoum International Airport. Another attractive feature of the park is its state-of-the-art infrastructure that provides various transportation, telecommunications, and logistics services to its customers. The Business Park also offers a great environment to work and live in, which includes banks, shops and onsite licencing and visa authority services. These services help make the park an integrated city that facilitates the ease of doing business for the companies operating in its district. Shoaib Al Rahimi, vice president of Business Park at Dubai South, stated that the Business Park has become a leading destination for companies to set up their business due to a variety of flexible options and solutions that are available for both small and large companies, in addition to the high quality of services and the variety of facilities offered to companies. "The directive of His Highness Sheikh Mohammed bin Rashid Al Maktoum, Vice President, Prime Minister and Ruler of Dubai, to launch a series of initiatives that help stimulate the economy, is in line with our approach to enhance the ease of doing business and to simplify procedures for our investors. This approach has made our current business model a success in the global business arena, especially when it comes to facilitating business operations and reducing costs," Al Rahimi said. 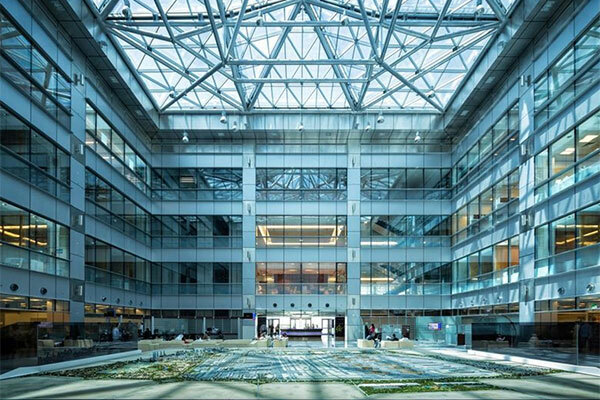 Al Rahimi pointed out that the lease space of the park equals 2.3 million sq ft, and the offices of the headquarters have all been fully leased out. He also remarked that 65 per cent of the first phase of the Business Park had been leased out and the second phase has been available for leasing out since early this year, which reflects the high demand that businesses have for setting up offices there. The list of leading international companies that have set up operations in the Business Park includes Emirates Post, Siemens Postal, Parcel and Airport Logistics; Nestle Middle East; and the University of South Wales, which opened the first aviation academy of its kind in the region. Other companies that operate in Business Park include Lagardere Travel Retail Duty-Free, Maersk Training, the Chinese Business Hub, CEVA Logistics and Joannou and Paraskevaides Limited.